This dish is characteristic of the cuisine of Venice and was adapted from Mario Batali‘s Simple Italian Food. The original uses bigoli, a type of spaghetti-like pasta with a hole in the middle, similar in shape to bucatini. I had some leftover calamari from last week’s dinner and added a bit of red pepper towards the end. The addition of cheese is completely unnecessary. Saute onion in olive oil over medium heat. Add anchovies and mash until anchovies disintegrate into a paste. Immediately add calamari; cook for 2-3 minutes, stirring occasionally. Remove from heat. Add pasta directly to saute pan, along with parsley [and red pepper flakes]. Toss to coat, and serve immediately. 02 Nov	This entry was published on November 2, 2007 at 6:26 am and is filed under food, general. Bookmark the permalink. Follow any comments here with the RSS feed for this post. Regarding cheese: Don’t most Italian-restaurant waiters try to make one look like the most ignorant-of-the-ignorant if one asks them for cheese to put on any pasta dish containing fish or seafood anyway? I’ve come to appreciate that wisdom as my palate has gotten more “refined” (i.e., in my old age), but the first time I made that faux pas at a restaurant, I was mortified at how condescendingly the waiter tried to steer me away from the cheese. This is the second time this week that you’ve reminded me that I’ve really got to buy some anchovies this weekend! It depends on the restaurant. Most [in my experience] will not care. I’d like to think that a renaissance of cooking has come about in America. Then again, I don’t watch TV, so I haven’t seen people like Alton Brown, Rachael Ray, Sandra Lee and Iron Chef. I appreciate that the average American won’t know the differences between red sauce and sugo di pomodoro. That’s okay. It’d be nice if discerning knowledge were more widespread. It just means we need to be patient with other people. Re anchovies — when you’re cooking for one, you learn right away to make use of everything you buy so as to minimize waste. Since fresh tomatoes are out of season, I had to do something that would go well with the type of dish that I had in mind. 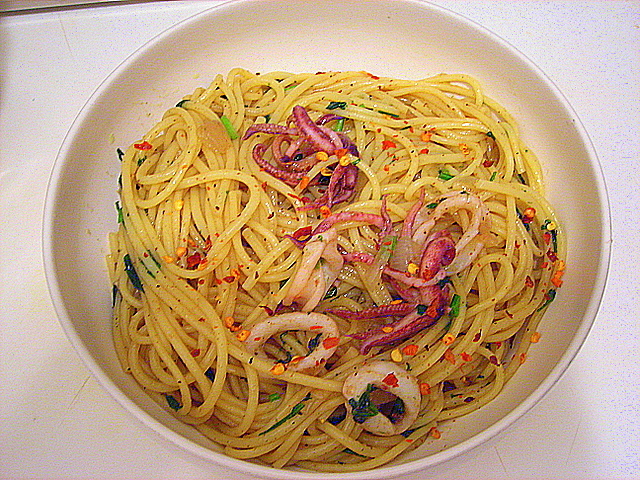 last night we had pound of squid in a similar pasta dish. cooked the squid on low heat in a tiny bit of olive oil which created a flavorful broth.